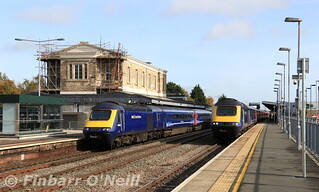 43153 leads 1B25 1045 London Paddington to Swansea as it arrives at platform 4 in Swindon, while 1A14 1100 Bristol Temple Meads to London Paddington stands at platform 3 with 43036 at the rear. 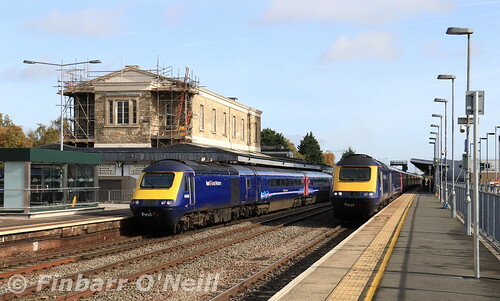 Out of frame on the left is a third HST set operating 1L50 1036 Cheltenham Spa to London Paddington. All sets still wearing the First Great Western blue livery.